Whole Foods shares are up 7% in after-market trading after the company releaseda positive outlook for the future. The company’s Q4 earnings-per-share were $US0.35, compared with analyst estimates of $US0.32. Same-store-sales rose 3.1%, and the company reported that it expects sales to grow up to 9% in 2015. The company has been challenged by competitors ranging from Trader Joe’s to Wal-Mart in recent years. AUSTIN, Texas, Nov. 5, 2014 (GLOBE NEWSWIRE) — Whole Foods Market, Inc. (WFM) today reported results for the 12-week fourth quarter and 52-week fiscal year ended September 28, 2014. During the quarter, the Company produced $US229 million in cash flow from operations and invested $US185 million in capital expenditures, resulting in free cash flow of $US44 million. In addition, the Company returned $US44 million in quarterly dividends to shareholders and repurchased $US100 million of common stock, or 2.6 million shares. The Company ended the quarter with total cash and cash equivalents, restricted cash, and investments of approximately $US1.0 billion. The following table provides the Company’s comparable and identical store sales results for the fourth quarter and for the first five weeks of the 16-week first quarter. Companies may define comparable and identical store sales differently; thus, growth rates across companies may not be comparable. Gross margin declined 20 basis points to 35.4% due primarily to a LIFO charge of $US5 million and higher cost of goods sold as a percentage of sales, partially offset by leverage in occupancy costs. Direct store expenses improved 21 basis points to 25.2% of sales due primarily to leverage in salaries and benefits. As a result, store contribution was 10.3% of sales, in line with last year’s record result. Additional information for the quarter for comparable stores is provided in the following table. The Company does not intend to publish this level of detail on a quarterly basis past fiscal year 2014. The Company notes that quarter-to-quarter changes in results by age category are typically attributable to stores shifting between categories. In the fourth quarter, the less-than-two-year-old category included the fewest number of stores and was materially impacted by a decrease in sales from relocated stores, along with an increase in the number of stores experiencing the “J-curve” effect (cycling over high opening sales volumes). For the first five weeks of the first quarter, comparable store sales growth in this category has returned to double digits. ** For the first five weeks of the first quarter, comparable store sales growth has returned to double digits. The Board of Directors today declared an increase in the Company’s quarterly dividend to $US0.13 per share from $US0.12 per share, representing an annual return to shareholders of approximately $US188 million. The next dividend is payable on January 27, 2015 to shareholders of record as of January 16, 2015. The Company expects to continue its value strategy and to make additional investments in areas such as technology, marketing, and new and existing stores. The Company believes this is the right strategy to drive sales growth over the longer term. Reflecting its ongoing value efforts, the Company expects a greater decline in gross margin, excluding LIFO, in fiscal year 2015 than in fiscal year 2014. The Company expects to maintain expense discipline and improve its cost structure, with the biggest savings coming from internal distribution, coordinated purchasing and labour leverage. For fiscal year 2015, the Company expects annual diluted earnings per share growth in line with or slightly higher than sales growth. 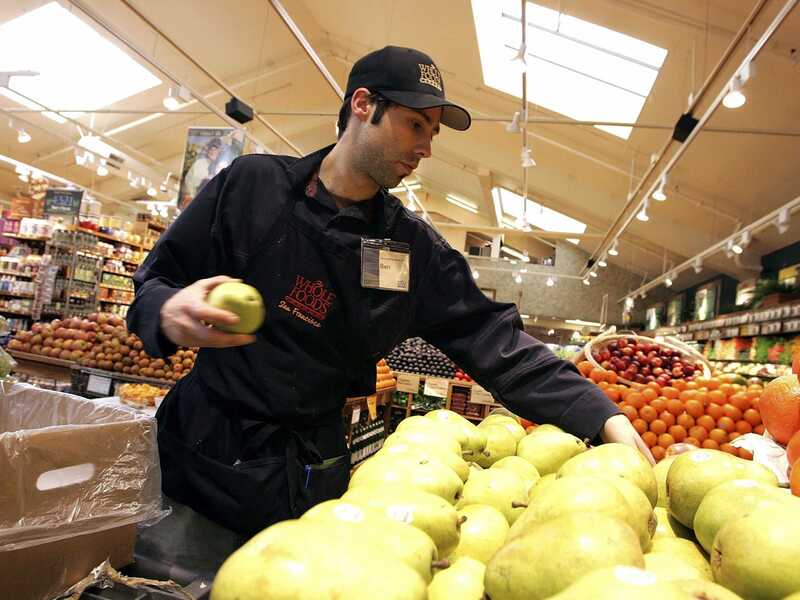 The Company expects store openings to be spread fairly evenly throughout the year, with the seven former Dominick’s locations re-opening as Whole Foods Market stores in the last three quarters of the year. The Company notes that average weekly sales and gross profit as a percentage of sales are typically highest in the second and third fiscal quarters, and lowest in the fourth fiscal quarter due to seasonally slower sales during the summer months. Gross profit as a percentage of sales is also lower in the first fiscal quarter due to the product mix of holiday sales. The Company also notes that Easter will fall in the second quarter of fiscal year 2015 versus the third quarter of fiscal year 2014, positively impacting comparable store sales growth in the second quarter and negatively impacting comparable store sales growth in the third quarter by an estimated 50 to 60 basis points.